Okay, I’m making that up. However, fall is a time of the year when many homeowners decide to make changes to their HVAC systems, and that often means having the AC replaced. Of course, we would rather you didn’t have to do that, and we’re making it easier than ever with our “Dirty Secret” campaign: we’re offering our 21-Point Energy and Repair Saver System Tune-Up for only $97 for a limited time. That’s a huge savings off the regular price—and you’ll receive the benefit of keeping your AC from ending up sent to the scrapyard too early. Here’s the important info to know about AC disposal, which is that all types of air conditioning systems as well as heat pumps contain chemical refrigerant. It’s what they use to move heat out of a home and cool it down. If you are replacing a very old AC, it may use a type of refrigerant containing hydrochlorofluorocarbons (HCFCs). This is a harmful ozone-depleting substance, and you don’t want it released into the environment. It also contains greenhouse gases. It’s great that you’re replacing this old AC for up-to-date equipment, but it needs to be disposed of properly. However, even the newer refrigerant blends can still contain greenhouse gases. 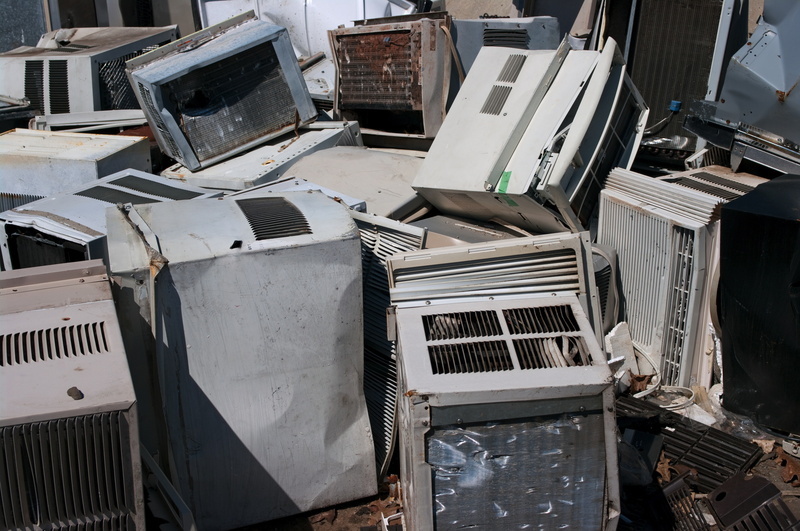 The bottom line: it’s illegal to drop an AC in a dumpster or drop it off at the scrapyard. That’s a government regulation, straight from the Environmental Protection Agency. We may recycle some units if they are still in decent shape and are not too old. Often, a customer will want to upgrade to a new model even when their current one is still in good working condition. For these, we may recycle the valuable components or even donate the unit to buildings that need them. You can trust us to handle all your HVAC services in Lenoir City, TN in ways that serve you, the community, and the environment. We are specially qualified and carry the CMC-C license from the State of Tennessee, which not all contractors have. Let us see that you have a great new AC, and your old one goes to the proper place. Call today to arrange for an AC replacement this fall. Russell & Abbott serves Blount, Knox, and Loudon Counties and the surrounding areas.